November | 2014 | Run. Work. Live. Repeat. Down in the basement of my house is where I keep my “wall of fame.” It’s a medal rack with several of my marathon finisher medals, including Boston. If I am counting right, I’ve done 14. California International Marathon next month will be my 15th. It doesn’t include my half marathon finishes, which I’ve lost count of but estimate at 50-plus. I’ve done at least a couple of those each year for the past 20 years. The other day a friend posed this question on Facebook: Do you think 5K and 10K races should give race finisher medals, too? To give you perspective: Most half marathon and marathons races today give participants finishers’ medals. Some shorter distance races do but not all. The response to my friend’s question was all over the board. Many people felt strongly that all races should give finishers’ medals and others did not for various reasons. There was discussion about how most half marathons and marathons give them but other distances don’t. Another argument followed the lines of how kids get trophies for finishing soccer seasons these days, no matter how they played or placed in their leagues. Yet another thread talked about how for some people finishing a 5K or 10K is the equivalent of their marathon and they wanted their finisher medals, too. To be honest I had never thought about the subject until that day and I had no idea it meant so much to people. It makes sense to me, however, in retrospect. All of us want to feel validated and cared for — perhaps even more so in these days of nonstop social media where everyone seems to be seeking another Facebook “thumbs up.” It’s also nice having something to show for your efforts. I can see where having a symbol means a lot. My friend wrote on her post that she felt that races have become bloated (and I would add, pricey) these days. I’ve been racing for 25 years and I can remember when entry fees were cheaper and you got simple cotton T-shirts and perhaps a few snacks afterward for your money. Back then, the only time I got a medal or anything more was if I placed in my age group (rare but it did happen occasionally) or won a raffle prize. Pick up any Runner’s World or Competitor magazines today and you’ll find slick,multicolor spreads advertising Rock and Roll Marathons across the country. It costs any where from $100-$150 to register for them; Boston entry is $175; and New York reigns as the Big Apple of pricing, to: $216-$255. My point is, it’s not cheap to race anymore and these races incorporate a lot more today: tech tees, goody bags, race expos and of course, the finishers’ bling. I don’t think the bling costs race organizers much to add on as they buy them in bulk, but they’ve become great marketing and another way to justify the costs. Most of the time I run races because I simply want to do them. The bling or schwag has little to do with my motivation, although it’s fun to get cool or usual stuff. A few years ago I ran the Pocatello (Idaho) Half and they gave out a 5-pound bag of potatoes. At that Nike Women’s Half in San Francisco you get you a Tiffany’s necklace handed to you from a guy wearing a tuxedo at the finish line. I confess, my Boston medal means more to me than the others because of how hard I worked for it. The night we flew out of Boston to head home, I almost lost it. We were stranded in the Louisville, Kentucky, airport and forced to evacuate our plane because of a tornado. We ended up spending a few hours in a tornado shelter at the airport and because of how quickly we were rushed out of the plane with two small children, I didn’t get a chance to grab my medal and take it with me. (It was in my carry-on, which we weren’t allowed to take with us during the evacuation.) Eventually we were let back on our original plane after the tornado had passed and I got my carry-on back. 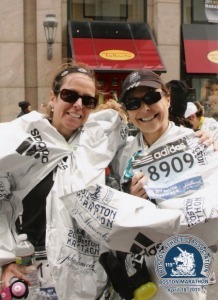 I worked hard to earn my bling with my friend Pam at the Boston Marathon, April 2011. My point is, I can see how bling becomes a way to motivate runners, even if it’s not what tops my list. 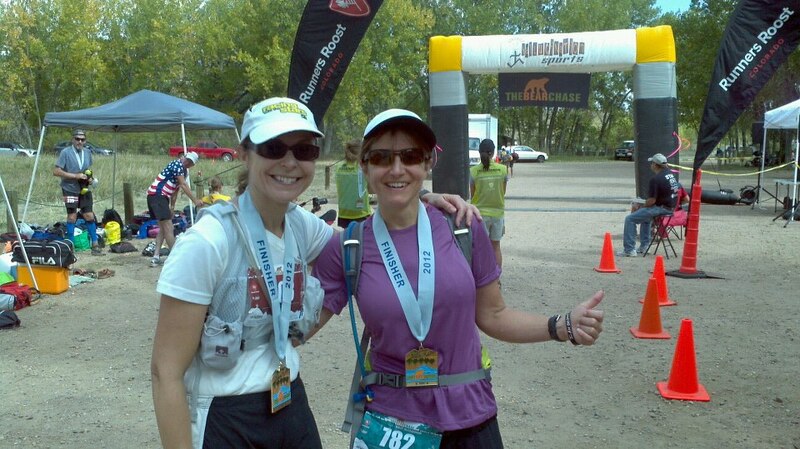 I’ve known several friends who’ve done ultra races and picked ones that included belt buckles. I don’t blame them. This past weekend as I was completing a 20-mile training run for CIM and it was snowing in Denver I was using every mental trick I had to keep going. When you train hard, no matter your distance, you use whatever you need to succeed. My friend Paula and I showing off our hard-earned bling at the Bear Chase 50K in Colorado, Sept. 2012. What do you think? Would you run for bling? Do you already? And do you think more races such as the 5Ks and 10Ks should include them? Today is a cross-training day; 1,200 meter swim; Mileage for 2014: 1,565.